Will Janet Nguyen and Van Tran face off in the 47th C.D. primary in 2012? Last year former Assemblyman Van Tran and Supervisor Janet Nguyen were forced by OC GOP party leaders to bury the hatchet as Nguyen endorsed Tran in his campaign against Congresswoman Loretta Sanchez. As you can see in the picture above, Nguyen wasn’t very excited about their deal. Next year might be an entirely different story. I am hearing that Nguyen is going to face off against Tran in a bloody primary battle for Sanchez’ 47th Congressional District, if the redistricting that is underway gives the GOP an edge in that District. Nguyen and Tran were once close friends – she worked for him and they even went on a double honeymoon, but they split when Nguyen ran for the Garden Grove City Council. She told me years later that Tran tried to force her to hire his buddies to run her campaign. Last year Nguyen’s former Chief of Staff, Andrew Do, secretly met with businessman and former U.S. Marine Quang Pham. Do was sent by Nguyen with an offer – if Pham would pay Do and Nguyen the sum of $100,ooo, Nguyen would make sure that Pham would be played up in local Vietnamese radio shows and newspapers, so he could win the GOP primary. Pham figured he would be hung out to dry in the general, so he dropped out of the race. Tran went on to win the primary and lose the general, to Sanchez. Nguyen learned a lot from Tran after all. One thing she did not learn is to be loyal to her friends. Tran will take a bullet for his comrades. Nguyen? Not so much. She dumped Do after he bungled her attempt to take over last year’s Black April event, in Westminster. Tran and his allies scuttled that effort by changing the time of her event to the morning – it turned out to be an epic fail for Nguyen. Do recently quit the Garden Grove City Council seat that Nguyen helped him win, even though he was accused of carpetbagging. He figured, probably correctly, that Nguyen was going to block his future attempts to ascend in politics. Sanchez can only hope and pray that Nguyen and Tran will bloody each other in a divisive and heated primary. She ought to go on to defeat the victor, but who knows? A lot will depend on whether voters in her district turn out to vote for President Barack Obama’s reelection. If Nguyen leaves her Supervisorial seat, there will be a bloodbath in the Democratic Party for the now open seat. I don’t know of any Republicans who are in a good position to hold on to the seat. Maybe that will change if the current Orange County Redistricting Commission, which is made up of the Supervisors’ Chiefs of Staff, dilute the Latino vote in Nguyen’s First District. Click here to read about the upcoming Orange County Redistricting Commission meetings. 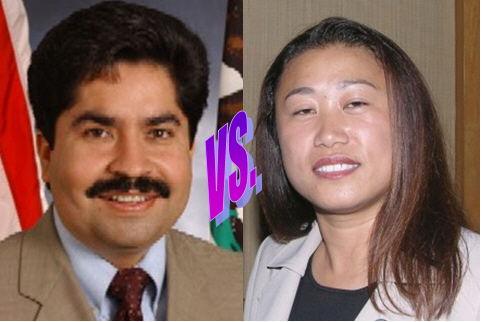 How badly will Jose Solorio beat Janet Nguyen in 2012? In two years, Supervisor Janet Nguyen, a Republican, is going to have to run for re-election. She only won by three votes, back in 2007. She won a full four year term in 2008. However, since then she has antagonized voters numerous times. In her latest gaffe, she has upset most of Little Saigon by taking over this year’s Black April event, which commemorates what happened when Vietnam fell to the communists and the people had to flee, many of them arriving here in California. Rumor has it that popular Assemblyman Jose Solorio, who is a Democrat, will be challenging Nguyen for the First Supervisorial District, in 2012, when, coincidentally, he will term out of the State Assembly. Supervisor Janet Nguyen, who represents the First District (including Santa Ana and much of Little Saigon) bought a sign a few years ago on an overpass on the 22 Freeway, which you can see in the slide show above. These signs are usually purchased by local non-profits and businesses. By purchasing the signs, they are promising to keep that area clean. There was a lot of debate when Nguyen purchased this sign as to whether it was appropriate to let a politician use this process to advertise herself. She promised to keep the area clean and clear.